FALMOUTH — In the briny deep, far from shore, the vast darkness is home to tiny, glowing fish, massive jellies that may be the largest animals on the planet, and an untold number of other creatures. Chief among them: What animals live there, and how many? Do they play a role in helping regulate the planet’s climate, and if so, how? Could these species provide a sustainable source of protein for the world’s growing population? In some cases, fishermen are already harvesting organisms that inhabit the twilight zone. Large trawlers in recent years have been scooping up increasing quantities of crustaceans that migrate from surface waters to the deep sea, grinding their catch into fishmeal for aquaculture or pet food. Many of those trawlers, however, are operating in international waters, beyond the reach of US law. Sosik said she hopes the team’s findings will eventually help forge international agreements that would prevent overfishing of the twilight zone. 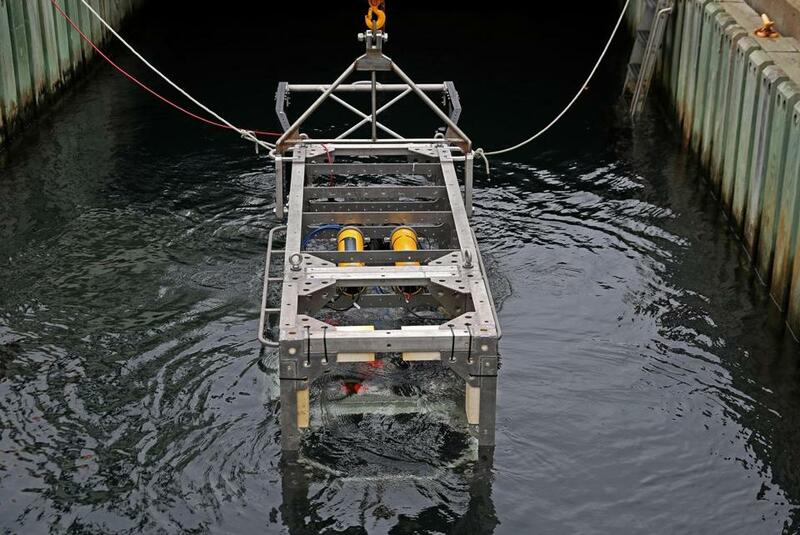 A crane lowered one of the new instruments — a $1.2 million, 2,500-pound, specially designed system of sonars and cameras called DEEP-SEE — into a test well. Using strobe lights, the 16-foot-longsystem has the capacity to detect microbes and other organisms as small as the width of human hair. 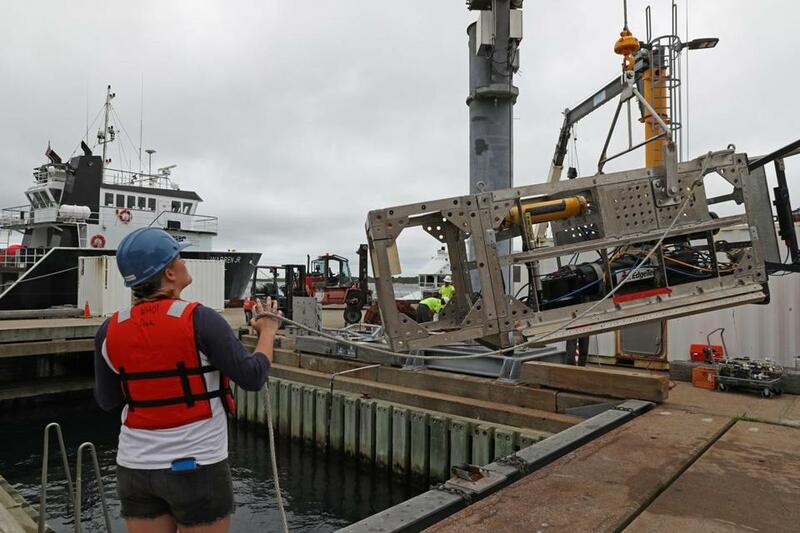 Kaitlyn Tradd, a mechanical engineer at Woods Hole Oceanographic Institution, helped a crane lift DEEP-SEE for testing. Being able to see such small organisms, and determine their numbers and habits with sophisticated sonar systems, should allow the researchers to better understand where the organisms migrate and what triggers their movement. 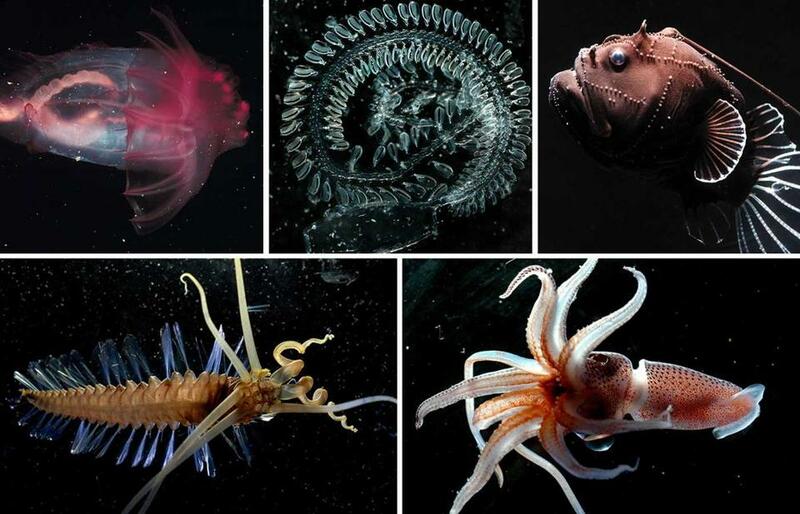 Many species in the twilight zone — everything from plankton to squid — are believed to participate every night in what the scientists call the largest migration on the planet, rising from the deep to feed near the surface before returning by daybreak to the safety of the darker, deeper sea. That migration is believed to help regulate the planet’s climate. As fish and other species migrate, they carry large amounts of carbon dioxide from surface waters into the deep ocean. They do so through the cycle of small creatures ingesting phytoplankton, tiny plants that absorb carbon near the surface, and then transferring that to the larger species that eat them. On Friday, they will start a 10-day expedition on a research vessel on loan from the National Oceanic and Atmospheric Administration. The ship will travel about 150 miles south of Woods Hole to the closest deep waters, a section of the North Atlantic that’s about 6,000 feet deep. 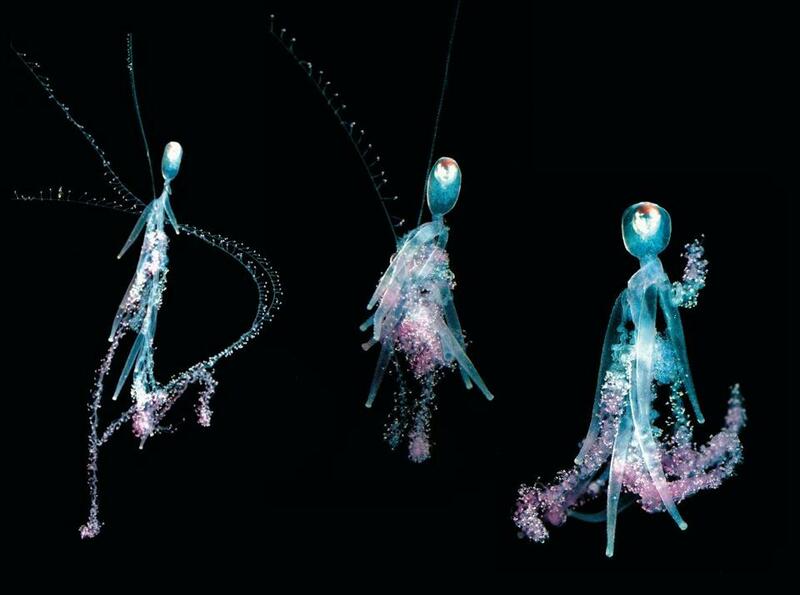 Three views of a single animal, sihonophore Rhizophysa.